Humpty Dumpty is a character in an English nursery rhyme, probably originally a riddle and one of the best known in the English-speaking world. He is typically portrayed as an anthropomorphic egg, though he is not explicitly described so. The first recorded versions of the rhyme date from late eighteenth-century England and the tune from 1870 in James William Elliott's National Nursery Rhymes and Nursery Songs. Its origins are obscure and several theories have been advanced to suggest original meanings. 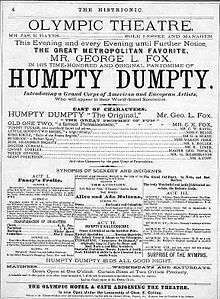 The character of Humpty Dumpty was popularised in the United States by actor George L. Fox (1825–77). As a character and literary allusion, he has appeared or been referred to in a large number of works of literature and popular culture, particularly Lewis Carroll's Through the Looking-Glass (1872). The rhyme is listed in the Roud Folk Song Index as No. 13026. It is a single quatrain with external rhymes that follow the pattern of AABB and with a trochaic metre, which is common in nursery rhymes. The melody commonly associated with the rhyme was first recorded by composer and nursery rhyme collector James William Elliott in his National Nursery Rhymes and Nursery Songs (London, 1870). The Roud Folk Song Index catalogues folk songs and their variations by number, and classifies this song as 13026. ^ Opie & Opie (1997), pp. 213–5. According to the Oxford English Dictionary, the term "humpty dumpty" referred to a drink of brandy boiled with ale in the seventeenth century. 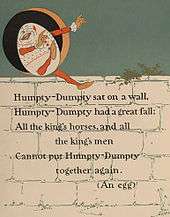 The riddle probably exploited, for misdirection, the fact that "humpty dumpty" was also eighteenth-century reduplicative slang for a short and clumsy person. The riddle may depend upon the assumption that a clumsy person falling off a wall might not be irreparably damaged, whereas an egg would be. The rhyme is no longer posed as a riddle, since the answer is now so well known. 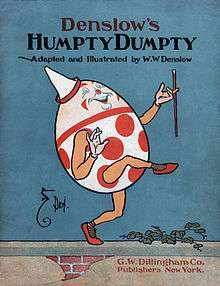 Similar riddles have been recorded by folklorists in other languages, such as "Boule Boule" in French, "Lille Trille" in Swedish and Norwegian, and "Runtzelken-Puntzelken" or "Humpelken-Pumpelken" in different parts of Germany — although none is as widely known as Humpty Dumpty is in English. The 1925 song "I'm Sitting on Top of the World", most notably sung by Dean Martin and Doris Day, mentions Humpty Dumpty twice in its lyrics, saying "just like Humpty Dumpty, I'm gonna fall". The rhyme has also been used as a reference in more serious literary works, including as a recurring motif of the Fall of Man in James Joyce's 1939 novel Finnegans Wake. Robert Penn Warren's 1946 American novel All the King's Men is the story of populist politician Willie Stark's rise to the position of governor and eventual fall, based on the career of the corrupt Louisiana Senator Huey Long. It won the 1947 Pulitzer Prize and was twice made into a film All the King's Men in 1949 and 2006, the former winning the Academy Award for best motion picture. This was echoed in Carl Bernstein and Bob Woodward's book All the President's Men, about the Watergate scandal, referring to the failure of the President's staff to repair the damage once the scandal had leaked out. It was filmed as All the President's Men in 1976, starring Robert Redford and Dustin Hoffman. Similarly, Humpty Dumpty is referred to in Paul Auster's 1985 novel City of Glass, when two characters discuss him as "the purest embodiment of the human condition" and quote extensively from Through the Looking Glass. Luis d'Antin van Rooten's 1967 book Mots d'Heures, a collection of homophonically translated poetry, includes a version of the rhyme in nonsensical French text, beginning "Un petit d'un petit, S'étonne aux Halles...". It has also been used as a common motif in popular music, including Hank Thompson's "Humpty Dumpty Heart" (1948), The Monkees' "All the King's Horses" (1966), Aretha Franklin's "All the King's Horses" (1972), Tori Amos's "Humpty Dumpty" (1992), and Travis's "The Humpty Dumpty Love Song" (2001). In jazz, Ornette Coleman and Chick Corea wrote different compositions, both titled Humpty Dumpty. (In Corea's case, however, it is a part of a concept album inspired by Lewis Carroll called "The Mad Hatter", 1978). ↑ Paul McGuire (26 November 2012). "Winning the Battlefield of the Future". News with News. Retrieved 18 September 2015. ↑ J.Smith, Poetry Writing (Teacher Created Resources, 2002), ISBN 0-7439-3273-0, p. 95. ↑ P. Hunt, ed., International Companion Encyclopedia of Children's Literature (London: Routledge, 2004), ISBN 0-203-16812-7, p. 174. ↑ J. J. Fuld, The Book of World-Famous Music: Classical, Popular, and Folk (Courier Dover Publications, 5th edn., 2000), ISBN 0-486-41475-2, p. 502. ↑ "Roud Folksong Index S297982 Humpty Dumpty". Vaughan Williams Memorial Library. English Folk Dance and Song Society. Retrieved May 20, 2016. ↑ Emily Upton (24 April 2013). "The Origin of Humpty Dumpty". What I Learned Today. Retrieved 19 September 2015. 1 2 3 4 5 Opie & Opie (1997), pp. 213–5. ↑ E. Partridge and P. Beale, Dictionary of Slang and Unconventional English (Routledge, 8th edn., 2002), ISBN 0-415-29189-5, p. 582. ↑ E. Commins, Lessons from Mother Goose (Lack Worth, Fl: Humanics, 1988), ISBN 0-89334-110-X, p. 23. ↑ "Nursery Rhymes and History", The Oxford Magazine, vol. 74 (1956), pp. 230–32, 272–74 and 310–12; reprinted in: Calum M. Carmichael, ed., Collected Works of David Daube, vol. 4, "Ethics and Other Writings" (Berkeley, CA: Robbins Collection, 2009), ISBN 978-1-882239-15-3, pp. 365–66. ↑ Alan Rodger. "Obituary: Professor David Daube". The Independent, 5 March 1999. ↑ I. Opie, 'Playground rhymes and the oral tradition', in P. Hunt, S. G. Bannister Ray, International Companion Encyclopedia of Children's Literature (London: Routledge, 2004), ISBN 0-203-16812-7, p. 76. ↑ I. and P. Opie, eds, The Oxford Dictionary of Nursery Rhymes (Oxford: Oxford University Press, 1997), ISBN 978-0-19-860088-6, p. 254. ↑ C. M. Carmichael (2004). Ideas and the Man: remembering David Daube. Studien zur europäischen Rechtsgeschichte. 177. Frankfurt: Vittorio Klostermann. pp. 103–104. ISBN 3-465-03363-9. ↑ "Sir Richard Rodney Bennett: All the King's Men". Universal Edition. Retrieved 18 September 2012. 1 2 "Putting the 'dump' in Humpty Dumpty" The BS Historian. Retrieved 22 February 2010. ↑ A. Jack, Pop Goes the Weasel: The Secret Meanings of Nursery Rhymes (London: Allen Lane, 2008), ISBN 1-84614-144-3. ↑ "The Real Story of Humpty Dumpty, by Albert Jack", Penguin.com (USA). Retrieved 24 February 2010. ↑ F. R. Palmer, Semantics (Cambridge: Cambridge University Press, 2nd edn., 1981), ISBN 0-521-28376-0, p. 8. ↑ L. Carroll, Through the Looking-Glass (Raleigh, NC: Hayes Barton Press, 1872), ISBN 1-59377-216-5, p. 72. ↑ G. Lewis (1999). Lord Atkin. London: Butterworths. p. 138. ISBN 1-84113-057-5. ↑ Martin H. Redish and Matthew B. Arnould, "Judicial review, constitutional interpretation: proposing a 'Controlled Activism' alternative", Florida Law Review, vol. 64 (6), (2012), p. 1513. ↑ A. J. Larner (1998). 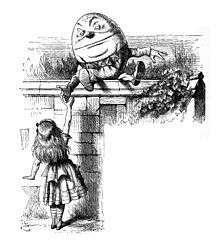 "Lewis Carroll's Humpty Dumpty: an early report of prosopagnosia?". Journal of Neurol Neurosurg Psychiatry. 75 (7): 1063. doi:10.1136/jnnp.2003.027599. PMC 1739130 . PMID 15201376. ↑ L. Senelick, The Age and Stage of George L. Fox 1825–1877 (University of Iowa Press, 1999), ISBN 0877456844. ↑ E. Webber and M. Feinsilber, Merriam-Webster's Dictionary of Allusions (Merriam-Webster, 1999), ISBN 0-87779-628-9, pp. 277–8. ↑ L. Frank Baum, Mother Goose in Prose (Mineola, NY: Courier Dover, 2002), ISBN 0-486-42086-8, pp. 207–20. ↑ Neil Gaiman, The Case of the Four and Twenty Blackbirds, first published in 1984 in Knave, available online. ↑ R. Rankin, The Hollow Chocolate Bunnies of the Apocalypse (London: Gollancz, 2009), ISBN 0-575-08543-6. ↑ J. Fforde, Well of Lost Plots (London: Viking, 2004), ISBN 0-670-03289-1. ↑ J. Fforde, The Big Over Easy: A Nursery Crime (London: Penguin, 2006), ISBN 0-14-303723-4. ↑ J. S. Atherton, The Books at the Wake: A Study of Literary Allusions in James Joyce's Finnegans Wake (1959, SIU Press, 2009), ISBN 0-8093-2933-6, p. 126. ↑ G. L. Cronin and B. Siegel, eds, Conversations With Robert Penn Warren (Jackson, MS: University Press of Mississippi, 2005), ISBN 1-57806-734-0, p. 84. ↑ M. Feeney, Nixon at the Movies: a Book About Belief (Chicago IL: University of Chicago Press, 2004), ISBN 0-226-23968-3, p. 256. ↑ P. Auster, The New York Trilogy (London: Faber, 1987). p. 81. ↑ R. Kienzle, Southwest Shuffle: Pioneers of Honky Tonk, Western Swing, and Country Jazz (London: Routledge, 2003), ISBN 0-415-94103-2, p. 134. ↑ B. L. Cooper, Popular Music Perspectives: Ideas, Themes, and Patterns in Contemporary Lyrics (Popular Press, 1991), ISBN 0-87972-505-2, p. 60. ↑ "Invisible band, track #12". Amazon.com. Retrieved 5 March 2011. ↑ "Ornette Coleman – Humpty Dumpty (LP Version)". Amazon.com. Retrieved 6 July 2010. ↑ "Chick Corea – The Mad Hatter". Amazon.com. Retrieved 6 July 2010. ↑ Bob Mendelsohn (9 September 2010). "Starting Over" (PDF). Jews for Jesus Australia. Retrieved 19 September 2015. ↑ Simon Sheridan. "The Complete Abba". Retrieved 19 September 2015. ↑ Chang Kenneth (30 July 2002). "Humpty Dumpty Restored: When Disorder Lurches Into Order". The New York Times. Retrieved 2 May 2013. ↑ Lee Langston. "Part III – The Second Law of Thermodynamics" (PDF). Hartford Courant. Retrieved 2 May 2013. ↑ W.S. Franklin (March 1910). "The Second Law Of Thermodynamics: Its Basis In Intuition And Common Sense". The Popular Science Monthly: 240. "Did You Ever See a Lassie?" "Old Woman Who Lived in a Shoe"
"A Sailor Went to Sea"
"Round and round the garden"
"Ring a Ring o' Roses"
"As I was going to St Ives"